The Austin Air HM205-Pink Allergy Machine Babys Breath HM205 Pink is designed for newborns and helps them breathe easier. The Austin air purifier helps reduce coughing, wheezing, snoring and sneezing, symptoms that can be a major pain for any young one. To improve the air environment in your nursery, this baby air purifer reduces particles in the air such as pollen, dust and Volatile Organic Compounds (VOC's) gases from indoor sources. Providing relief for baby allergies and baby asthma has never been easier. This nursery air purifer reduces bacteria and viruses, and is uniquely designed to protect your baby from air contamination. 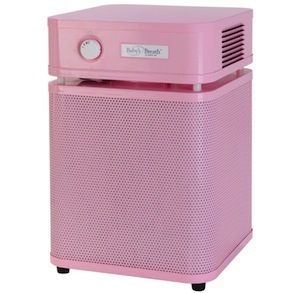 Individuals concerned with the effects on their baby from particles or gases emitted from furniture, rugs, paint and outside industrial gases would benefit from this pink air purifier. The Austin HM205 is chosen by the American Red Cross and FEMA to address the air quality concerns in post 9/11 New York.